I wasn’t planning on posting Weekend Rewinds until The Boy took the Bar at the end of July. If I miss a Weekend Rewind between now and July 30th you can assume that I am spending my days at The View and The Boy is spending his at a Cup O’Joe or the library at Moritz. As I said, I wasn’t planning on starting my Weekend Rewinds until…. My mom took us on a (driving) tour of the Southeastern Correctional Institution, located a mere 2 miles from where we will be having Pond Week(end) at the end of this week. Security here is apparently tighter than Martha’s former home at Camp Cupcake yet the prison sits right along the side of the road (that must explain the 5 rows of barbed wire). This fine prison is the former home of the Boys Industrial School and supposedly a thirteen year old Bob Hope. 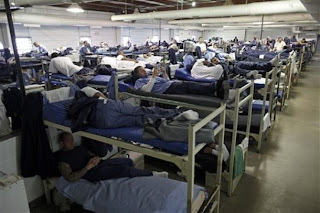 When driving by on your way to wherever you are headed (or during Driver’s Ed as the case was for my sister) you can see the inmates enjoying their outdoor time in a very graciously sized space and get an up close look at the facilities. In my opinion, the inmates’ softball field is a little too close to the woods for comfort. All in all the tour was an enjoyable experience. In fact, I plan on taking The Boy for a "visit" this weekend. 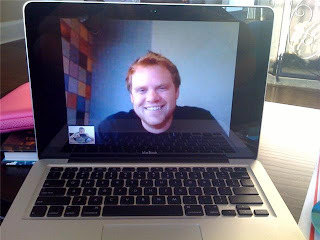 To top off my lovely weekend at The View and visiting some of Ohio’s finest, I spent the evening skyping with The Boy. If only he’d gotten me a Mac sooner. We could have chatted while he sat in Columbus putting off studying and I sat in Lancaster putting off cleaning.